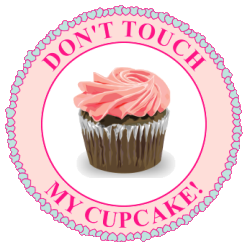 The reason I started this blog is because of one woman: Robin Moses! 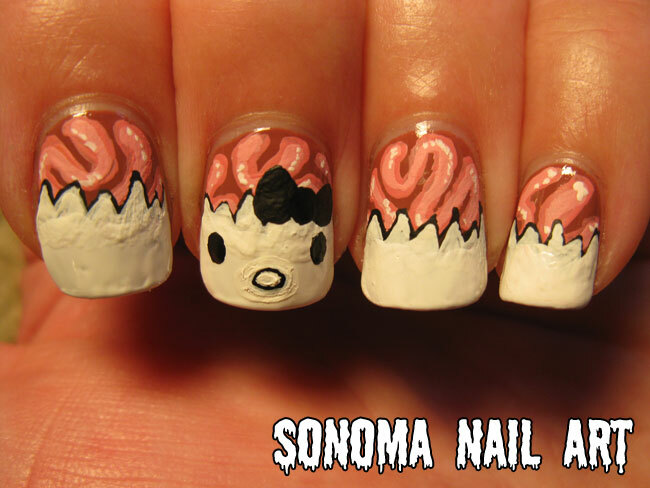 She is the most incredible nail artist I have seen. Her designs are innovative, fun, and she is brilliant at sharing those designs with the rest of us. Robin's videos are really great to get ideas from, and to learn new techniques. I rarely copy one of her designs directly, instead use techniques or a part of a design to springboard and try a hybrid or something new. The one thing Robin asks is that she is credited if you copy one of her designs. I feel like almost everything I do is connected to Robin, so I guess all of my posts are Inspired by Robin Moses! She is a doll, so please go check out her work. I guarantee you will learn something new. This manicure is Inspired by Robin Moses' Pink and White Zombie French Manicure. (I love how Robin loses it at 5:15 in the video. So hilarious!) 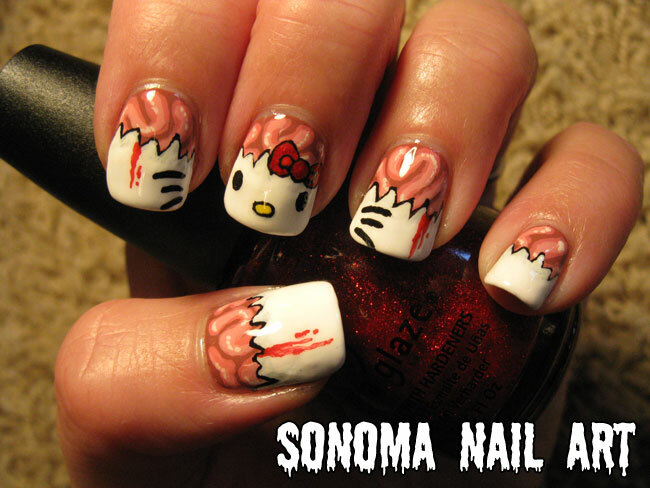 I changed it up a bit, and swapped out the sinister zombie face for an equally sinister Hello Kitty zombie face. Bwahaahahhahaha! Oh this kills me, it is sooo funny! 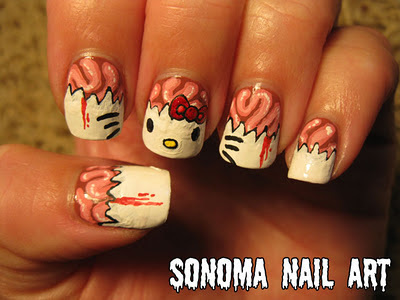 Hello Kitty had her little skull ripped off by zombies, and now she needs to feast on kitty brains. And maybe a Keroppi or two. 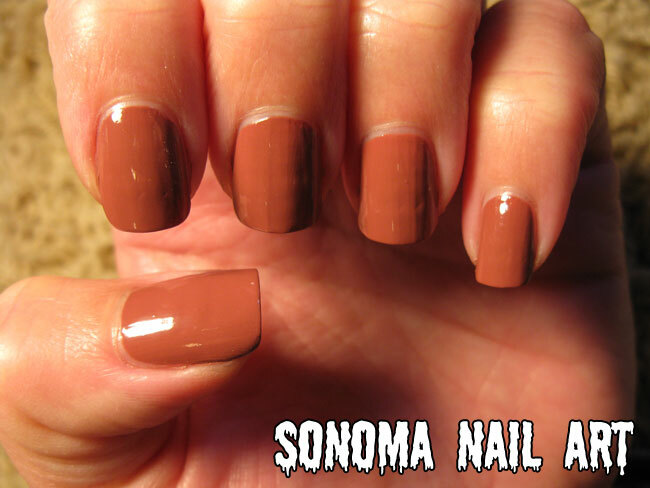 I started with this very pretty base color, which is sort of a mauve-ish brown. 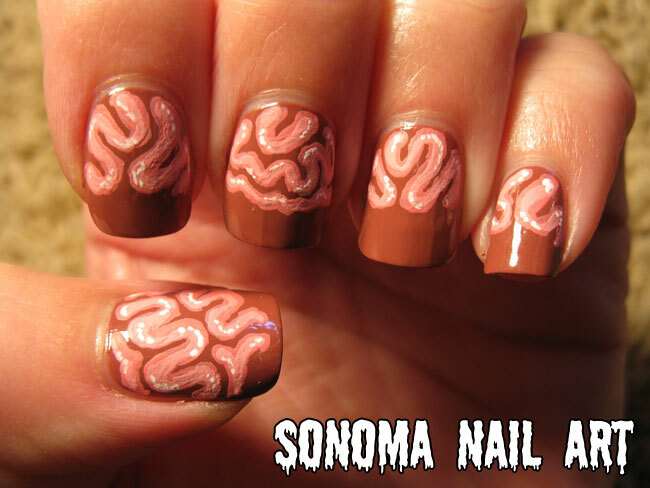 Great for BRAINS! Then I added in a dirty pink color for the twists and turns of the brain. Random shapes are best, with each nail a little different. As Robin does in her video, I added a lighter pink to make the brain lobes more 3D, and topped with little bits of white paint to make it look juicy. You see why I love Robin?! She's so macabre! Next came a black jagged line, and I topped that with white paint to get the bone fragments up close to the brains. 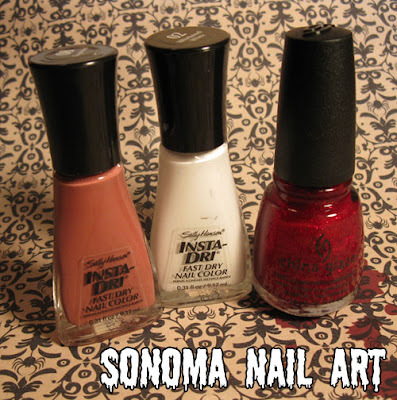 Once that line was in place, I painted white nail polish down the rest of the nail to make the french manicure. Robin's video illustrates this so well. Here is why my design veers from Robin's. I decided to go with a Hello Kitty zombie. I added her eyes, nose, and bow. Finally, I topped the white in her nose with yellow paint (this helps the yellow color really pop), whiskers, blood in a few areas, and the red of her bow, as well as a little bit of glitter on her bow to make it blingy. Cause even Zombie Hello Kitty needs bling. Polished used in this manicure: Sally Hansen Insta-Dri Expresso, Sally Hansen Insta-Dri Whirlwind White (this color is SOOO gloppy, does anyone have a better white that they like to use? I even tried thinning this with NO luck. Blech!) and China Glaze Ruby Pumps. I also used Cult Nails Get It One basecoat and Seche Vite topcoat. Tomorrow is Halloween and the final day of this challenge. The original list says that on Day 31 I am supposed to recreate my favorite challenge. 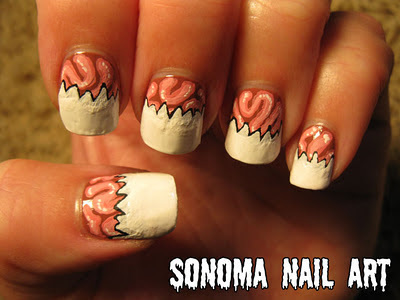 Um, I think I would rather just do another rad Halloween manicure. So that is what I am going to do. I haven't decided what to do yet, and will probably get on it tomorrow morning. Any suggestions? Thanks to all of my followers and those who are commenting. I love your encouragement and enthusiasm. This has really been a FUN challenge! That is really creative! Good job! This is so amazing. I wish I could do this. I might try the brains. Ace, you should totally watch Robin's video. She shows you how to do the whole thing. Awesome, I love Robin and Hello kitty! 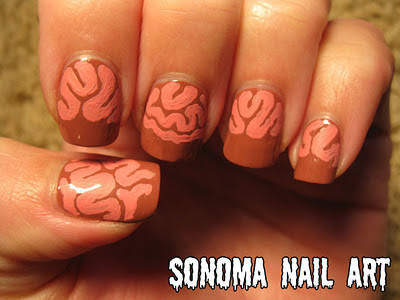 brainssssss! This is fantastic, great work! Thanks Tera! I'm a fan of both, too! Oh wow! I love Hello Kitty! You are truly amazing! Great job! Sinful Colors makes a pretty decent white. I think it's call Snow me White or something like that. Thank you, Monica! I do too! hey, i ve been inspired by u and i've done my nails: http://inlovewithmanicureandmake-up.blogspot.com/2011/11/notd-blue-cute-kitty.html check out:) hope u like it.